19th April 2016: Directed by Stephen Daldry, JB Priestley's epic thriller is still doing the rounds. This week it heads to Richmond Theatre, and the auditorium is filled with students who I am guessing are studying the piece at their relevant schools etc. 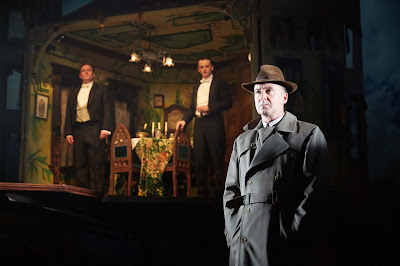 An Inspector Calls is still a powerful piece of theatre, and this production excels in giving you edge of the seat moments, chilling orchestral music underscoring the wind and rain of the grey and damp exterior of the Birling's house, set on stilts up and away from the dank town below them. The set is rather nice, but at the opening of the show when the characters are in the house, it is difficult at times to hear dialogue because they are so far away and in an enclosed piece of set - it could benefit from a mic or two to enhance the vocals over the underscore at times, but when the house swings open, it all falls into place - literally. The cast do a grand job, of note is Katherine Jack playing Sheila Birling, a great actress in the making here. Geoff Leesley plays the father Arthur Birling to great effect, along side Caroline Wildi as the mother, Sybil Birling. Inspector Goole, played by Liam Brennan does a fine job, interrogating all the characters in turn. 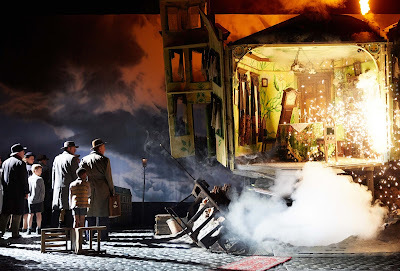 Running at one hour forty five minutes with no interval, the action runs along at a good pace, with the house crashing in on the family at the end, signifying their world falling in around them at the shock and revelations of their past. Twenty years on, and An Inspector Calls is as mesmerising as ever.